Bottom Line: a solid two way bookshelf speaker that has a particularly nice classic look. Is now dated though, and since it doesn’t appear to have been discounted from the MSRP, better choices now exist that have since been released. The power specs are on the modest side – these are pretty clearly intended to be standalone satellite speakers for close to mid range listening, or perhaps be surround speakers. A 30 W 8 ohm speaker is unlikely going to get loud enough to be the keystone of a full sized home theater system. Cambridge does make a more powerful floorstanding SX speaker (review forthcoming) that is presumably intended to be the main pair of satellites in such a setting. But keep in mind that louder and more powerful speakers aren’t necessarily always better. You only need as much power as volume you actually need, and close/mid-range speakers generally sound best at lower volumes. The tweeter and driver are made out of a silk and paper blend respectively. Paper/cloth drivers have the propensity to sound particularly great at close range and lower volume, but are more prone to damage and wear and tear than polymer or metallic drivers are. The warranty of two years is also pretty minimal for speakers of this quality and price tier – 5 years is a much more common standard you’ll see amongst competitors. The SX60 uses a pretty standard MDF cabinet that either has a black or walnut mock grain wood finish. 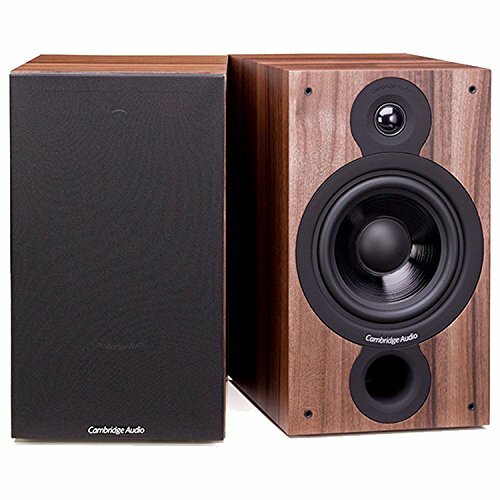 Wood colored speakers have a tendency to look tacky, but the sheen vinyl cones and black gaskets actually look quite good in this case, and the walnut colored version has a nice classic look – kind of plain and minimalist, but tasteful for sure. The quoted response range is quite good for a two way bookshelf speaker. Cambridge doesn’t specify a variance on the range though, so it’s fair to assume there will be some drop off above 41 Hz. 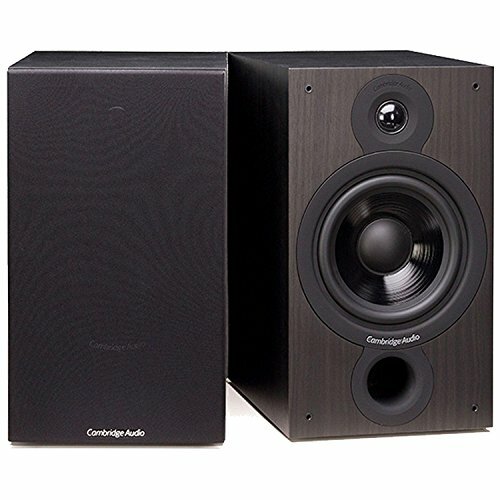 Two way bookshelf speakers are generally designed to work in tandem with a subwoofer, and Cambridge makes a few of those too (reviews forthcoming), but the SX60’s bass might be sufficient at close/mid range, which is not so often the case with speakers of this design. The SX60 is over five years old now, and while it may have been truly competitive back then, many speakers that are either cheaper or more powerful have since been released. We’re surprised this hasn’t become discounted from the MSRP, which usually happens with older speakers, and there’s a decent chance that will happen sooner than later, but until then we’d say these are too expensive and better choices are currently available. See the links below for alternative recommendations.